We love BeWILDerwood. We visited earlier this year during our short break in Norfolk (you can read our BeWILDerwood review here). It was our first visit but if we are back in the area we would definitely ago again, and would totally recommend it to others! Keep your eye on the blog as there will be another giveaway coming up another lucky In The Playroom reader to take their family to BeWILDerwood! Meanwhile, if you have not yet got any plans for Father’s Day then why not think about a trip to BeWILDerwood as Dads will be going in for free! There will be another couple of extras for the day too which you can read about below. Fathers Day is a great chance to get some extra quality time with the kids and celebrate how fun parenthood can be, so BeWILDerwood would be a great choice! I know Mr Z, T & R’s Dad was really impressed by BeWILDerwood when we visited and really enjoyed our day there. 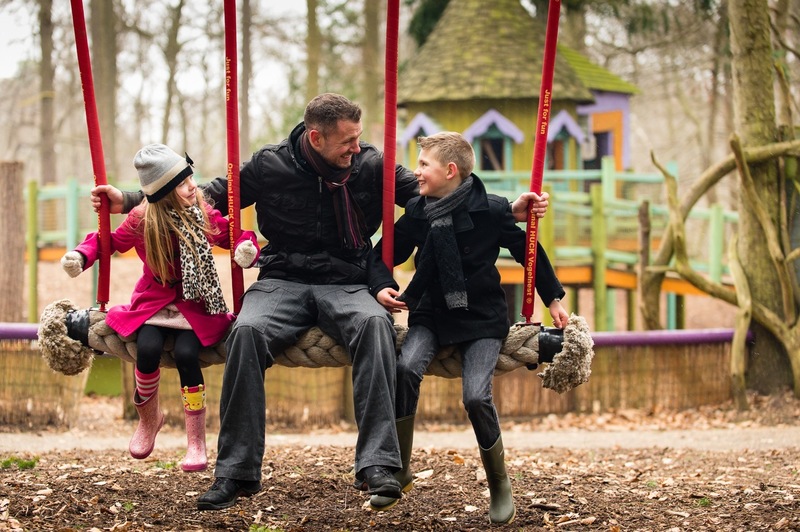 They love dads at BeWILDerwood and think they deserve a little present this Father’s Day. So bring Dad for FREE on Sunday the 15th June. Go along and enjoy a day of outdoor play and adventure – challenge dad on the Slippery Slopes and watch him get befuddled in the Muddle Maze. If you come along dressed in black and yellow (just like a bumble bee), you can collect an extra special treat for your dad at storytelling time. Have you heard of the Slitherigrubs from the BeWILDerwood story book? Their glowing lights and silvery threads helped save little Sticklenose, (a teeny tiny Twiggle) when he got stuck up a tree. Bees are just as useful as Slitherigrubs, very important and they love flowers almost as much as Mildred loves the colour pink! When you head off home, the people at BeWILDerwood will give you a little bag of flower seeds to take with you for your garden, your school or perhaps for a window box outside your home. The bees will just love them! Dads can also get a FREE-bee stencil at the face painting pavilion!